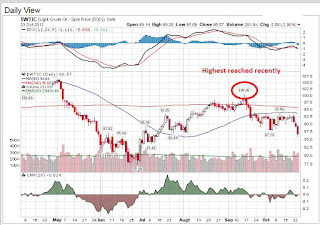 Daniel Loh: Crude Oil can't stop falling! We did mention about Energy Sector and Crude Oil bearishness recently. Do you remember? On 5th September, we issued an article to say that oil price has reached its height. On 16th September Light crude price reached a high of $100.42. If not for QE, it could have been earlier. Do pay attention to our articles in future for market and sector analysis. Our market sentiment indicator has served us well in trading. In the article, we advised everybody not to be bullish about Energy stocks and US Energy sector stocks. We did mention that in the mid term trend (1-2 months), this sector will turn downwards. 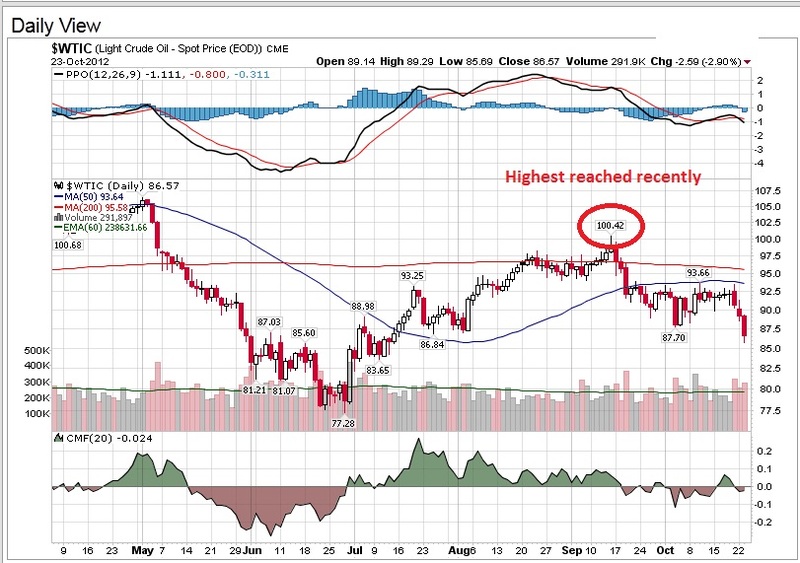 We need to take the opportunity to short crude oil and energy sector whenever it rebound upwards instead of going long. Take a look at the crude oil price now, $85.65. A fall of $15 from its peak. Oil has fallen 8/9 days. Energy sector stocks are also falling. From now onwards, mid term wise (1-2 months) do not be bullish to expect crude oil price to rise, or bet on energy related stocks even with the winter period. How do you capture the profits with FOREX and Futures? Why can't forex work with INDICATORS! No indicator method works? 1) Does indicator works in Forex? What is no indicator trading?